My counter was full of good but not perfect apples from the espaliers. Each had a little scab or a bruise or a small wormhole, so they weren’t going into storage in the refrigerator. Over the course of the day the whisper in my brain: “apple fritters…apple fritters….” rang louder and louder until finally I gave in, handed my kids apple peelers and called it a project. Because these Apple Fritters are made with 100% whole wheat flour, they are a bit toothier and more rustic than the sugar-shellacked, grease-bomb fritters from the donut shops of my youth. They are crispy on the outside and soft on the inside, but are nothing like the toothache/spun-air combo of a Krispy Kreme. These make a respectable, though certainly not healthy, breakfast or snack item. Finely grated zest of one lemon, about 1 tbsp. 1 ½ pounds non-hydrogenated vegetable shortening, lard, coconut oil or high-heat frying oil, as desired. 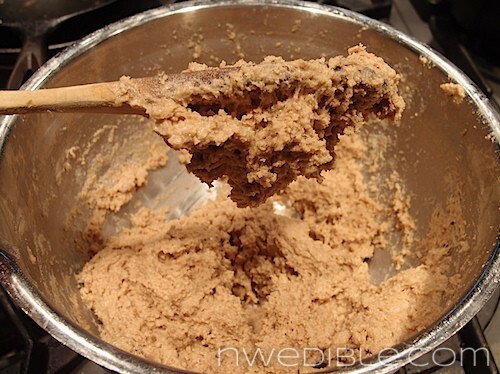 Whisk the dry ingredients together thoroughly. 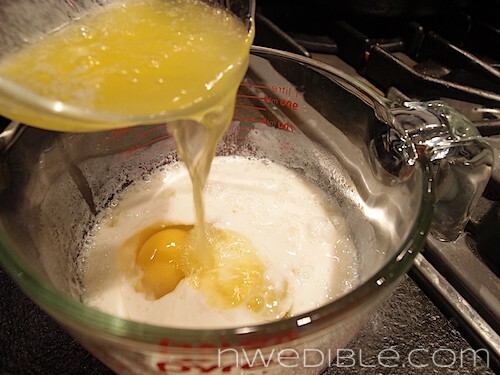 Add the lemon juice to the milk and let stand for about 30 seconds, or until milk is curdled. Mix in the eggs and melted butter. Stir to combine. Add the wet ingredients to the dry ingredients and stir to just combine. The dough should be quite thick. 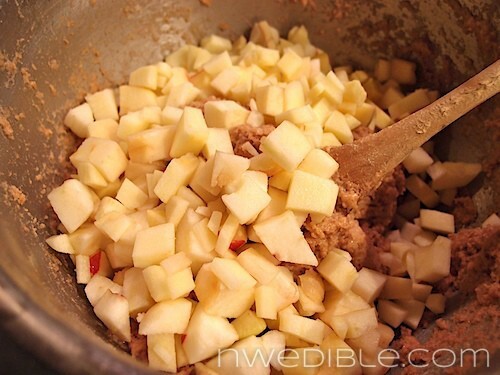 Add in the diced apples and lemon zest and fold everything together thoroughly. Obviously, be careful. We are talking about taking over a pound of fat up to emergency-room-burn inducing temperatures. While these fritters are not a particularly difficult item to fry, it’s best to always approach frying with a healthy amount of respect. I keep my two year old well clear when I fry. 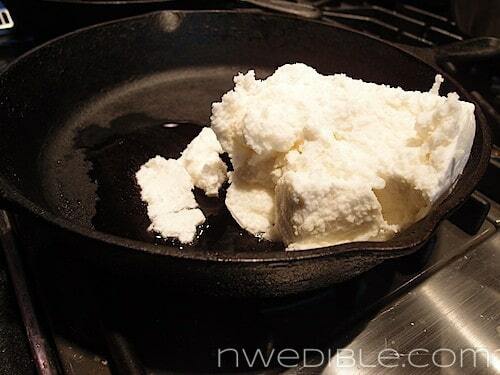 Heat your frying fat of choice over medium heat in a deep cast iron skillet. The fat should reach at least ¾” up the side of the skillet and there should be at least an inch or two of skillet above the oil. Test the oil temperature by dropping in a small piece of dough. If it floats and looks like lots of little bubbles (but not big rolling bubbles) are coming off the underside of the doughnut, and the outside browns without burning, then the temperature is right. About 370 is what you are shooting for if you temp your oil. 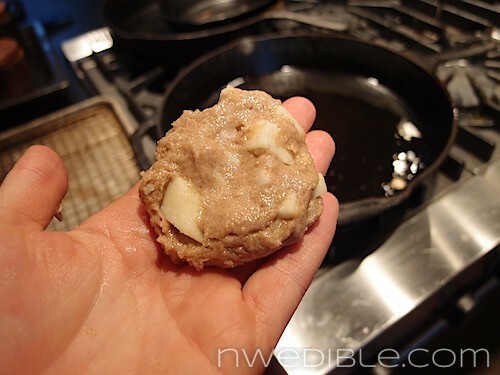 Scoop portions of dough into your hands and pat the dough into a disk about a ½” – ¾” thick. It will puff and swell as it cooks. If the dough is too sticky to pat down, a bit of flour on your fingers will solve that problem. Fry the fritters several at a time, taking care not to overcrowd the skillet or allow the temperature of the oil to drop too low. 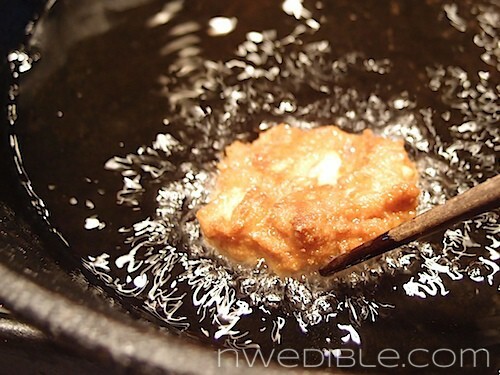 Adjust the temperate to maintain that rapid flow of small bubbles from the underside of the fritters. When the first side of the fritters are golden brown and crispy looking, carefully flip them over with a thin spatula or wooden chopstick and fry the second side. 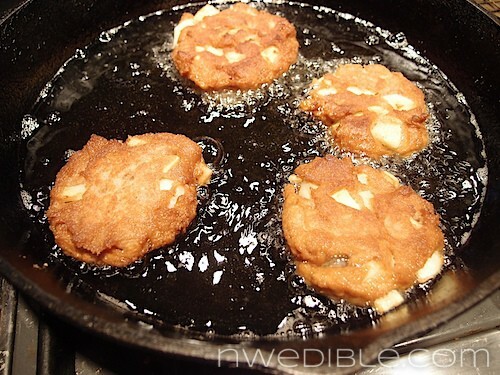 When the fritters are equally golden on all sides and the inside of the dough is fully cooked (if necessary, you may have to sacrifice and taste one right away to make sure they are cooking properly), remove the fritters to a cooling rack set over a sheet pan to drain and cool slightly. 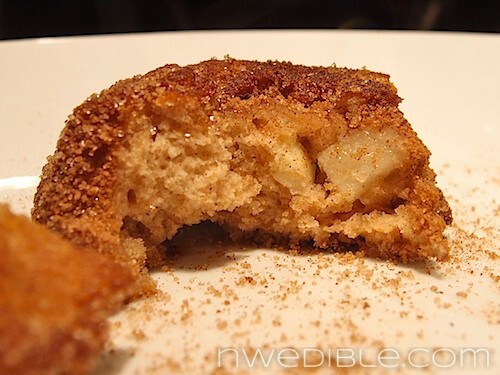 If desired, dust or roll the fritters with the cinnamon sugar before serving. 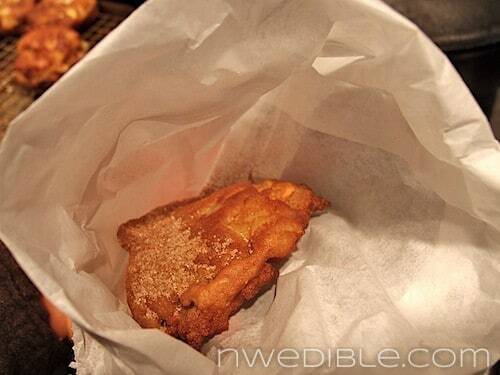 I have little waxed paper sandwich bags left over from my catering days, so I popped a bit of cinnamon sugar and a hot fritter into a bag for each of the kids. They got to shake their own fritter and then eat it straight out of the bag. 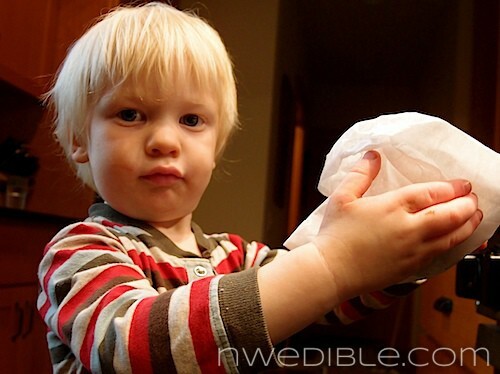 For my kids, food from a bag is like, super totally cool. 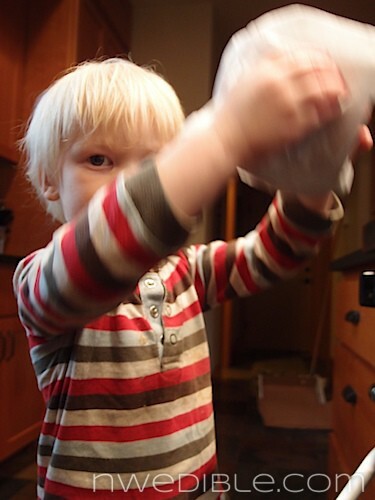 Here is my son demonstrating his fritter-shaking technique. Food-from-a-bag….hmm, I think I may try that with mine! I’ve found that with slim exception, I’ve been able to switch over to whole wheat flour for almost all of my recipes, or at least 1/2 ww & 1/2 white. Honestly, the only “have to” make with white flour has been my biscuits for biscuits and gravy or savory biscuits as the ww flour tends to make it a little sweeter than would go well with some dishes. For new recipes, I usually start with a 1/4 ww flour, then just keep upping it until it’s just right. Agreed. I like just worrying about “stocking” one type of flour, or at least feeling like I can substitute at will if I want. Quite liberating. 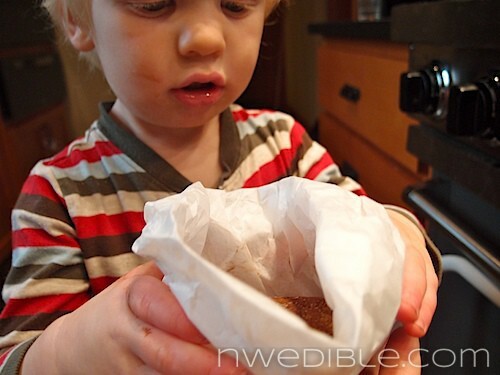 Thinks kids love out of paper bags: anything pastry-like, any firm fruit or veggie-snackie (carrots, pepper strips, apple slices), and – POPCORN. Don’t know what it is, but individual bags of popcorn is the best thing ever. You can even let them “flavor” their popcorn with their own thing: cheese, salt & butter, cinnamon sugar, chocolate chip add-ins, etc. Like a popcorn bar. Very hot with the littles. 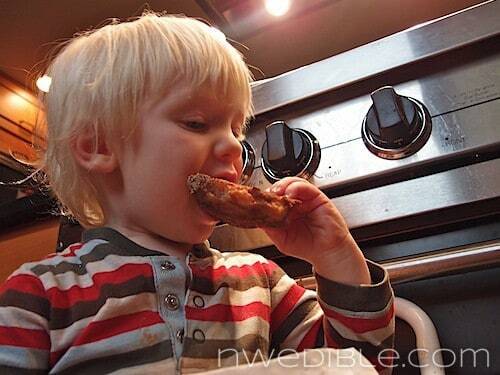 Love the pics too (food and kids alike)! How are these not healthy? Looks top shelf to me. That’s my kind of dietary wisdom. And your kids look so cute and healthy, Mashallah/touch wood 🙂 What a wonderful thing you are doing, brava, brava, brava. I think these are a more “Italian” type fritter than the typical American donut shop fritter, so if you make them you’ll have to let me know if they are reminiscent of Italian-type pastries. Yum plus perfect timing! 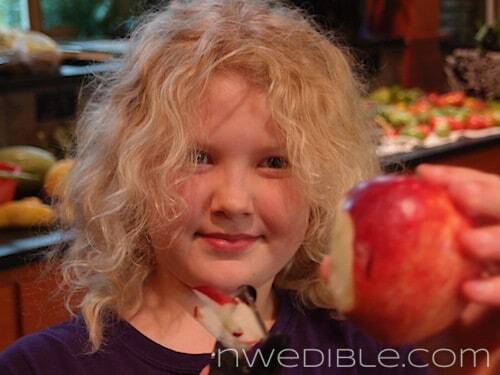 Just bought 20# of Gold Rush & Spitzberg apples at a local tasting event here in Olympia. I love that these use whole wheat flour. I’ve been using whole wheat pastry flour as a while flour substitute which brings up the nutrition factor as well as keeps the results a little fluffier than regular whole wheat. I very typically only keep whole wheat in the pantry…more out of laziness to restock than anything else, and have slowly realized that I can make most everything with whole wheat, too. I think ww pastry would be an improvement to this recipe, to be frank. If I had it on hand I likely would have gone that route. Good idea. I can pass on any doughnut out there without a second thought, but apple fritters are my downfall. Even as a kid, I passed up the frosted sprinkled crap and went straight for those huge lovely fritters. When you first posted a pic of these on your FB page, I thought, finally, I have to make those!! …and then my husband came home minutes later with a few little white bags, and inside one of them, helpfully, was a commercial apple fritter (I think he knows me). 😛 I didn’t want to eat it, knowing I could make it so much better, but I just. couldn’t. resist! 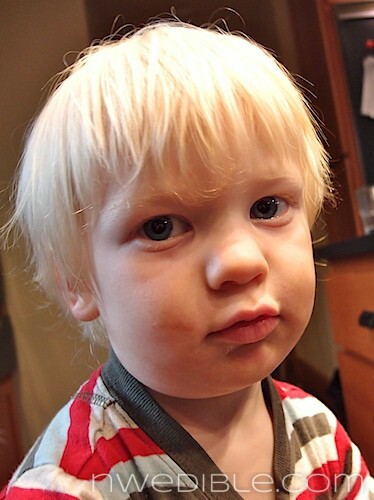 Those CHEEKS! The stripes! Oh yeah, and the fritter… :o) Yum! Do you suppose you can bake them or put them in a cupcake tin? Or would that just ruin the whole experience. I never fry anything. I think at that point you are making a muffin and I would opt for a wetter dough and more leavening. Fantastic and super easy, BIG THANK YOU! I’ve got 2 boxes of apples to process, this will make a lovely addition. Glad to help, thanks! Enjoy your big ol’ haul of apples! I have a question about the “wet stuff”. My step son has a casein allergy so I can’t use any of those lovely wets. I have baked cakes using canned pumpkin but it is quite dense although he enjoys it as he doesn’t know the difference. Do you think using canned pumpkin in this recipe would make the fritters too dense? As a side, I would also substitute 1/2 c of the flour with golden flax meal simply because I like the extra goodness and flavor. I’ve tried substituting flax/water for eggs before, but it just doesn’t do the job IMO. My understanding is that eggs are casein free (you may have better info than I do, though). I would substitute any oil or non-dairy fat for the butter and I would substitute whatever your non-cow-milk of choice is for the milk. I would assume almond, hemp, soy or rice milk are available in casein-free versions. Speaking from experience, soy milk performs just like cows milk in situations like this, where it is acidified and turned into “mock buttermilk” and then used in baking. I would be optimistic that the other dairy-free milks would be similar. If you did a pumpkin puree substitute, I would definitely add oil or fat to it, and would thin it with apple juice or apple cider. This has the potential to give a lovely result, actually, but you’ll need to play around to figure out your exact ration. I tweaked your recipe to make apple-pumpkin fritters! I followed it as written with the following exceptions and they turned out great! omit the milk/lemon juice and use 1 cup of pumpkin puree instead. Yum! I’ve never made these. Now I’m going to have to. I’ll have a tree full of apples in a couple of months.